There is a story about the tinker Imrich Dotčár who went to learn the tinker´s craft as far as to Russia to become a successful and rich man there. In the town of Samara he got the concession for building the town street lighting. The generous native of Kysuce provided the inhabitants of Samara with one extra hour of lighting for which the grateful inhabitants called him respectfully The Lord of Light. In 1998 the inhabitants of Turzovka built a monument in their town to the Kysuce tinkers. It was dedicated on the occasion of the 400th anniversary of founding their town. 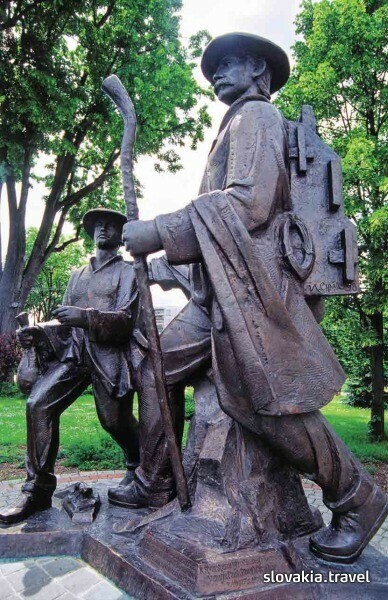 The author of this bronze sculpture called Drotár a džarek (The Tinker and his Apprentice) is the prominent Slovak sculptor Miroslav Cipár who was born in the nearby village of Vysoká nad Kysucou and is the honorary citizen of the town of Turzovka.